Life in Harlan County as we have known it for the last six years is coming to an end. 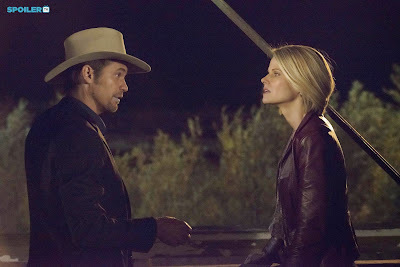 That in and of itself will come as no big surprise to fans of Justified since the news has been bandied about since the middle of the fourth season that after this, the FX long runner would take its final bow with new airings. What is surprising about it is how aware the characters seem to be of this fact. In one of the more recently debuted trailers, Joelle Carter’s Ava declares “You say that like we ain’t already dead." The fact the show’s ending is a theme that hangs heavy over the characters and their interactions with Boyd (Walton Goggins) having a couple of similar lines. Boyd still yearns for the fairytale ending with Ava in “Costa Rica, Brazil maybe. Some place they got white sand and blue water.” Ava, on the other hand, is far more suspicious of her former paramour which makes her task as the marshals’ criminal informant all the more difficult. Rachel (the wonderful Erica Tazel) has settled into her job as the Chief Marshal quite well, almost making the viewer forget that she was ever not in charge. Timothy Olyphant's Raylan...well, Raylan is Raylan; smart quips and sharp, quick acts of violence to get the job done. The episode is divided into a loose A/B plot structure. A bit of a departure from last year’s episodes focusing on many threads at once with Raylan and the Crowes and Ava in prison and Boyd in Detroit/Harlan/Mexico, but the structure is certainly put to good use, as in true Justified fashion, there are few if any wasted moments. Oh and there's Boyd's newly rekindled interest in banking establishments, but our favourite outlaw's probably just starting up a new checking account right, guys?